No trip around Italy would be complete without stopping at Venice. 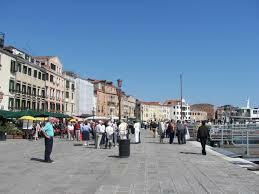 This is truly an amazing city that was built on over 100 small islands in marshy lagoon in the Adriatic Sea. The city is the capital of northern Italy’s Veneto region and exploring it means that you’ll find something to delight in around every corner. The transportation here is by boat on the canal. 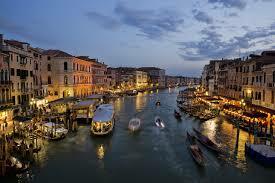 Venice has been the background of many romantic movies. As you are taking an armchair tour of this city you can listen to this wonderful boat song and imagine you are drifting on the Grand Canal beneath a full moon. 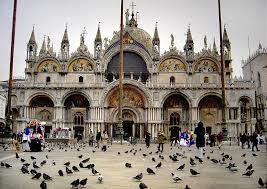 St. Mark’s Basilica is a sight to behold with its tapering spires, Byzantine domes, mosaics and impressive marble. 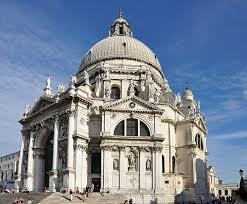 This is Venice’s signature church and was originally built for St. Mark’s corpse. It has been nicknamed the “Church of Gold” due to its splendor. It has a separate campanile or bell tower that stands 98.6 meters tall and is one of the city’s most recognizable landmarks. However the first chapel was destroyed in a fire in 932 and the new basilica was built in 1094. The basilica would be added to for the next 500 years. There are many incredible things to see inside of the basilica and one of the highlights is the Pala d’Oro, a fascinating gold altarpiece. From the outside the basilica is quite impressive with a Greek cross layout and Egyptian marble walls. The facade seems to ripple like a wave and has five niched portals that are capped with mosaics and frothy stonework arches. For over 950 years the apostles and the Madonna have been standing guard at the main door. It is well worth it to explore the treasures inside of the basilica. 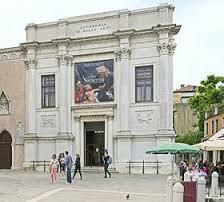 The museum displays incredible art treasures and restored mosaic fragments from the 13th to the 16th centuries. The largest square in Venice is St. Mark’s Square. This is the square that you see in pictures of Venice where there are literally flocks of pigeons. The centerpiece of this square is St. Mark’s Basilica. The other dominant building is the Doge’s Palace, a beautiful Gothic structure facing the Venetian lagoon. 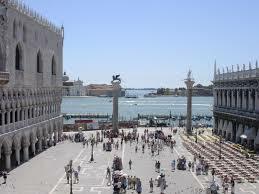 Found between the Doge’s Palace and the Library is the Piazetta or little piazza San Marco. There are two columns here that pay homage to two of Venice’s patrons – St. Mark and St. Teodoro of Amasea. These columns served as the official gateway to the city. This little square was also the place where criminals were executed until the mid 18th century. Pigeons are the main residents of this square and there are so many that they have done some damage to the delicate mosaic of St. Mark’s Basilica and to some other buildings as well. It appears the pigeons have become uncontrollable but the city passed a law that bans the feeding of the pigeons. 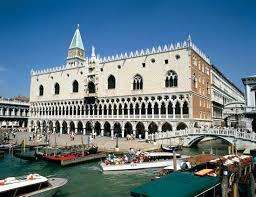 A most impressive sight is the Doge’s Palace built in Venetian Gothic style. There is ornamentation everywhere. The capitals of the lower colonnade are decorated with historic and biblical scenes. There are two columns of the piazetta facade that have been painted red to draw attention to the fact that this was the place of public executions at one time. At the facade you can also fing the Porta della Carta or the main entrance to the palace. The gate leads one into the courtyard and on the central platform there are two statues – one is of St. Mark’s winged lion and the other of the Doge Francesco Foscari, who served in the mid-fifteenth century. From the inner courtyard there is access to a flight of stairs called Scala dei Giganti that lead up to the Doge’s private quarters and the stair are guarded by two huge statues of Mars and Neptune. Inside the palace the walls are of stucco and the ceilings feature grand art works. Visitors can also take a look at the map room and the armory. The largest room in the palace is the Grand Chamber Council found on the second floor. It runs the entire length of the southern facade and looks out toward the waterfront. In this room you can admire “Paradise” full wall art work by Tintoretto painted in 1577. Down below in the basement are several prison cells where convicts awaiting trial were held. Venice’s historic Gallery dell’Accademia uncovers the development of Venetian art from the 14th to the 18th centuries featuring the art work of Bellini, Titian, Tintoretto, Veronese, Canaletto and others. Every room in the gallery has something to admire and to delight the eye. You won’t want to miss the Peggy Guggenheim Collection. Heiress Peggy Guggenheim lost her father on the Titanic and she became one of the great collectors of the 20th century. She lived in an impressive home by the canal. 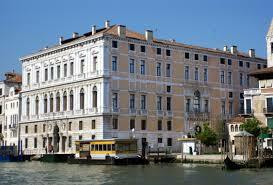 Her Palazzo Venier dei Leoni has an art collection of surrealist, futurist and abstract expressionist art. There are works by 200 artists including her ex-husband Max Ernst, Jackson Pollock, Picasso and Salvador Dali. There is art everywhere you look inside and outside. Take the time to wander through the sculpture garden. Peggy was granted permission to be buried beneath the Giacometti sculptures and beside her beloved lapdogs. Through the gardens you’ll come to a pavilion with a sunny cafe, a bookshop and temporary exhibits. Standing guard at the entrance to the Grand Canal is Basilica di Santa Maria della Salute. This is a 17th century domed church that was commissioned by Venice’s plague survivors in thanks for salvation. Amazing as it may seem it is said that this church has mystical curative properties. Italian painter Titian eluded the plague and lived to the age of 94. He left many masterpieces behind in the Salute’s sacristy. The architecture is impressive as the lines of the building converge beneath the dome forming a vortex on the inlaid marble floors and at the center is a black dot which is said to radiate healing energy. In the sacristy you’ll find 12 art works by Titian among them a self-portrait with the artist as St. Matthew. There is also his earliest known work from 1510 – Saint Mark on the Throne. Many other impressive art works are also found here. There are still thousands of people who observe the annual pilgrimage on Festa della Madonna della Salute on November 21. They head on over the pontoon bridge from Piazetta Santa Maria del Giglio to the church and light candles for the continued health of their families and their city, Venice. People are amazed when they first see Grassi Palace from the canal. There are massive sculptures created by contemporary artists such as Thomas Houseago right in the front of this 1749 Neoclassical palace. Here you can admire the art collection of French billionaire Francoise Pinault. The art exhibits are rotating and the interior is also something to behold with Baroque ceiling frescoes. You can take the time to relax in the cafe with a great view of the Grand Canal. The interior of the cafe gets redesigned by contemporary artist with each new show. Don’t pass by the Statue of Bartolomeo Colleoni. 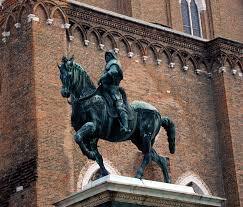 This is one of only two public monuments in Venice and this is quite an impressive galloping bronze equestrian statue. This is an early Renaissance sculpture that commemorates one of Venice’s most loyal mercenary commanders. Colleoni commanded armies for the Republic from 1448. Upon his death in 1474 he bequeathed 216,000 gold and silver ducats to Venice on the condition that the city erect a statue to him in Piazza San Marco. It was sculpted by Florentine master Andrea del Verrocchio. Upon a rooftop is Torre dell’Orologio a clock that has Two Moors in bronze guarding the clock and the bell-hammering mechanism sounds the hours. 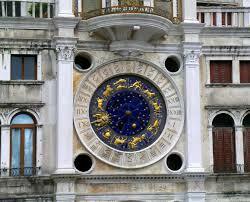 Below the two Moors is Venice’s gold-leafed 15th century timepiece that tracks the lunar phases. This clock was designed by Zuan Paolo Rainieri and his son Zuan Carlo in 1493-99. What is interesting is that the clockworks needed constant upkeep so there was a live-in clock watcher and his family living there until 1998. Then there was a nine year renovation and now the clock works on its own. There are 132-stroke chimes keeping time, moving barrels show the minutes and hour on the world’s first digital clock face and wooden statues of the Three Kings and an angel come out from the side panels annually on Epiphany and the Feast of the Ascension. You can climb up the four-storey spiral staircase past the clockworks to the roof terrace to get a bird’s eye view of the city. Stretching west from San Marco Riva degli Schiavoni is a paved boardwalk and one of the world’s great promenades. Schiavoni literally “Slavs” refers to fishermen from Dalmatia who arrived in Venice in medieval time and discovered that this was a great spot from which to cast their nets. For many centuries boats would dock here and the waterfront became a place for traders, dignitaries and sailors that came from ports all around the Mediterranean and even farther. The great poet Petrarch found his inspiration here living at No. 4175, east of Rio della Pieta. Many of the old mansions lining the boardwalk are now ritzy hotels. Snaking its way through Venice is the Grand Canal. This ancient waterway is 2.36 miles long and 30 to 90 meters wide and in most places up to 5 meters deep. The canal is lined with around 170 buildings that were constructed from the 13th to the 18th centuries by wealthy Venetian families. The majority of the city traffic goes up an down the canal. Upon the water you can find private boats, water buses, water taxis and of course the famous gondolas. Give me a romantic ride in a gondola any day. There are three famous bridges for foot traffic across the canal – the Rialto Bridge, the Ponte Degli Scalzi and the Ponte dell’Accademia. A fourth, modern bridge the Calatrava Bridge was recently added. It is believed that the canal follows the course of an ancient river. Along the canal you can see many different types of architecture in the buildings lining it such as Venetian-Gothic, Baroque, Renaissance and Classical styles among others. Once a year the first Sunday in September the Grand Canal hosts the Regata Storica or historical regatta. The first boat races upon the canal were held in the 14th century. Before the races there is a fantastic boat parade that is led by the Serenissima, a grandly decorated boat. Many visitors come for the regatta to see historic boats and crews dressed in traditional clothing. 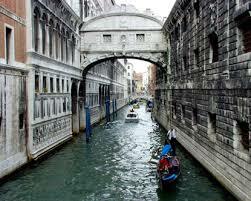 Venice’s most famous bridge is the Bridge of Sighs. It was designed by Antonio Contino and built at the beginning of the 7th century. It spans the Palace River and was originally built to connect the Old Prison and interrogation rooms in the Doge’s Palace to the New Prison located directly across the river. There are many different ideas about how the bridge got its name. One is that prisoner’s being led across the bridge to their execution would often sigh. There is the story that if a couple kissed under the bridge at sunset while floating along in a gondola they would have eternal love. The romance of it all often made the couples sigh while passing under the bridge. Poet Lord Byron stated in this writings, “I stood in Venice on the Bridge of Sighs, a palace and prison on each hand”. The Bridge of Sighs stretches high above the canal and is known to be one of the finest examples of bridge architecture in the world. It was created in Italian Renaissance style. The bridge is 11 meters wide and made out of white limestone with two windows with stone bars at the summit of the enclosed bridge. It took over two years to build. As you cross the bridge you’ll notice many mascarons or sculptures that depict sad and angry faces. You can also see them from a gondola. I know this is rather long but we’re talking about the wonder of Venice and you can imagine that this city offers so much more. Put it on your list of must see cities.